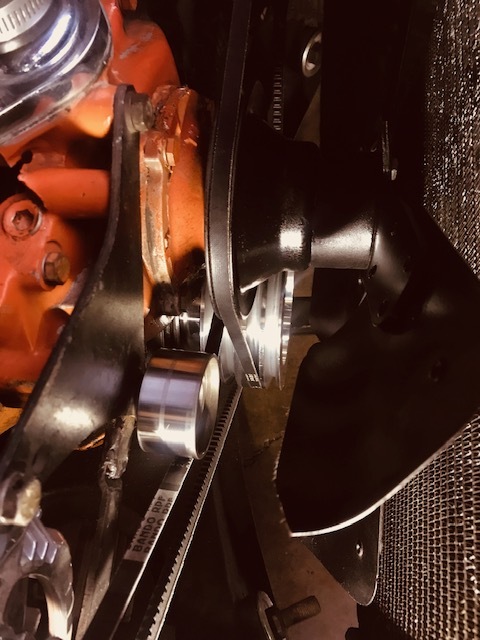 I purchased an aluminum racing pulley from CVF Racing in MN for big block Dodge. It fits perfectly. Everything lined up including the timing and after installation I checked that and it was right on. In the picture below I did some self engineering by adding an idler bearing which lines the alternator belt to clear the water pump better. I took it on a good drive yesterday and all is well. The alternator charge is more steady as it was bouncing around before. Next by Date: shift transmission cable end?